Niue comeback to beat Greece and make final. Niue 16 defeated Greece 8. The first Cup Semi Final for the 2018 Emerging Nations World Championships 2018 has Niue Rugby League taking on Greece Rugby League. It was a wet and miserable day for our first Cup Semi, but never the less, both teams were fired up and both sets of supporters were there in full support and showing their pride nice and loudly! It was a very sloppy opening 20 minutes for both side. With the ground slowly turning into a swimming pool, it was expected. The weather turned this game into a back and forth fight for field position and completion rates. Both Niue and Greece had plenty of opportunities in the opening 20 minutes, but a mixture of handling errors, penalties and the weather all made sure that this game was going to be a grind. A penalty goal in the 19th minute by Sam Stratis gave us a 2-0 opening 20 minute score line. Finally after 24 minutes of play, Greece went over thanks to more wet weather handling errors. An attacking chip over the top by the Greece halfback bounced up awkwardly for the Niue fullback who couldn’t real the ball in and ended up losing the ball for Jake Vrahnos to pick up and dive over for the opening try of the game. Sam Stratis converted for a 8-0 Greece lead. Niue finally got their first points through one of the best solo tries you will see. Big man Wes Lolo showed his dominance up front all game, but finally it resulted in points for Niue, and they were much needed points. A barn storming run by the front rower resulted in a few defenders being left behind on the ground as the prop continued his run downfield. With some agile feet and a killer fend, he quickly dismissed the fullback and supporting winger before dropping down over the line for the try. Eddie Paea converted the try. 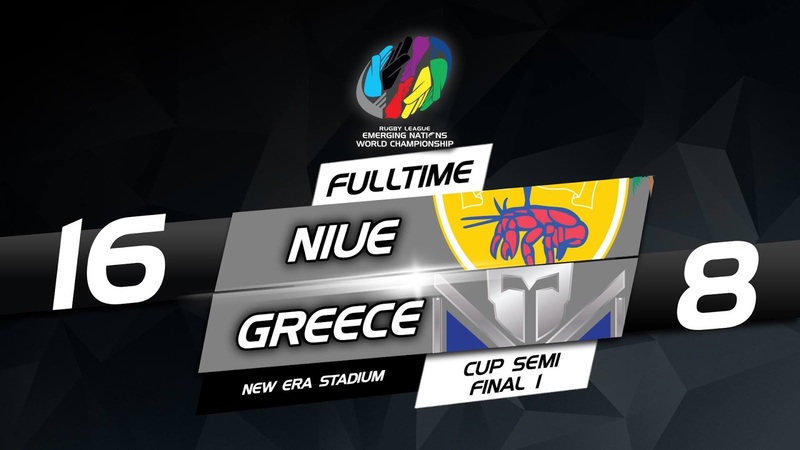 Despite a few late attacking sets by Niue, they weren’t able to convert them into points and the Greece side took a 8-6 lead into the sheds for half time. Niue took the lead just 6 minutes into the second half through Justice Utatao. A dummy and go leading to the line break by the five-eight allowed him to draw in the fullback and find his winger in support who was able to go over and give Niue their first lead of the game. The conversion was successful by Eddie Paea. A third try for Niue came 56 minutes in off the back of a set scrum piece. A dropped kick by Greece gave Niue the perfect field position and they took full advantage off it. Straight out of the scrum, the quick hands allowed a fast paced right hand spread which forced the overlap and the try for Cyruss Payne in the corner. The conversion was unsuccessful. Niue lead 16-8. The final 10 minutes saw the desperation of Greece come out. With time against them and the scoreline not favouring them either, Greece had a few opportunities to close the gap and bring the game to within a scoring play. The Niue defence however stood strong and kept Greece at bay as they came back from 8-0 to beat Greece 16-8 and march their way into the final. Greece will now play for the bronze.